Dr. John Walker and Dr. Liz Walker of Walker Orthodontics recommend that their patients who play sports wear a mouthguard so that their braces stay protected during their activity. Dr. John Walker and Dr. Liz Walker believe that it is important for all his patients to know exactly what mouthguards do and why they are important. Active patients can focus then on their game and also stay on schedule with their orthodontic treatment near Action, MA. The team at Walker Orthodontics treats all their patients with the care and consistency that their lifestyle demands while ensuring the best possible treatment outcomes. 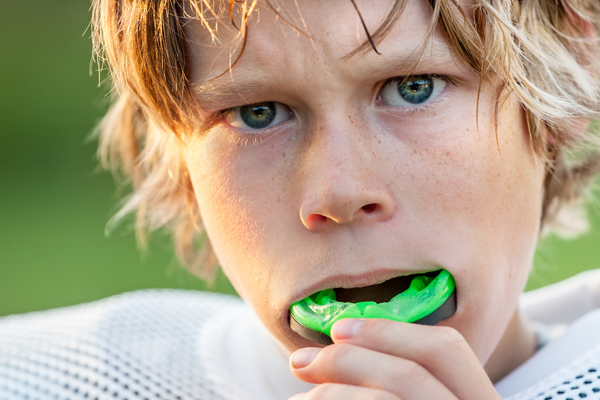 Mouthguards help prevent players from chipping or losing teeth when sports or physical activities get rough. Many sports teams and leagues (football, lacrosse, and ice hockey) require mouthguards because they help keep the players’ teeth and mouth safe during a game or practice. When a patient has braces, mouthguards are even more important so the braces stay intact and do not break. What are the different types of mouthguards available for those with braces? Stock Mouthguards: Stock mouthguards are inexpensive, come ready to wear, and can be bought at most sporting goods stores. Stock mouthguards offer the least amount of protection for patient’s teeth and braces. They are one, uniform fit and therefore cannot be adjusted easily. Some patients find them bulky and that they make talking and breathing difficult. Boil-and-Bite Mouthguards: Boil-and-bite mouthguards mold to the player’s teeth and gums. To get a custom fit, a patient would boil the mouthguard in hot water to soften the thermoplastic material. The patient then bites down on the warm, softened mouthguard to mold it perfectly to fit their teeth and braces. Boil-and-bite mouthguards can be found at most sporting goods stores and, although they are a little more expensive than stock mouthguards, they are not overly expensive. Orthodontic Mouthguards: Orthodontic are available only by orthodontists like Dr. John Walker and Dr. Liz Walker. These are the most expensive type of mouthguards and are customized to fit and protect the teeth and braces. Orthodontic mouthguards offer the most comfort and protection of any of these types of mouthguards.